First, second and third rounds are worked in different colored wool. Fourth and fifth rounds are of black (note: I have worked the final rounds in pink so you can see the stitch structure clearly). Chain 6 and join with a sl st to form a circle. Round 1: Chain 3, 15dc into circle. Fasten off. Round 2: Join 2nd colour between the ch 3 and 1st dc of the previous round, 3ch, 1 dc in same, * skip one space, 2 dc in next space, skip 1 space, 2dc, 2c, 2dc in next space; rep from * twice more, skip 1 space, 2dc in next sp, skip 1 sp, 2dc in next space, 2ch, join to 3rd ch at beginning of round. Fasten off. Round 3: Repeat Round 2, working and extra group of 2dc between corners. Fasten off. Round 4: Change to black and work another round as established. Round 5: Ch 3 and work as established but work 6dc in each corner instead of 2dc, ch2, 2dc. Squares for afghan are sewn together. 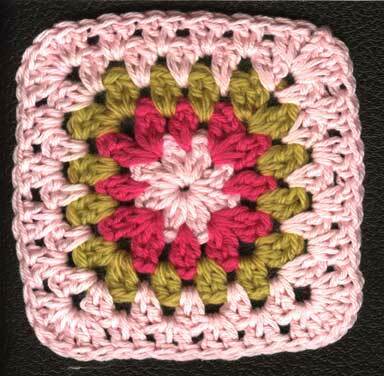 One afghan has 156 squares with no two centres alike. Work a border of black about a finger wide in any stitch you like. Crazy stitch is pretty if you don’t care for shell stitch. After it is put together a cross stitch of gold in silk in the corners of each block is pretty.